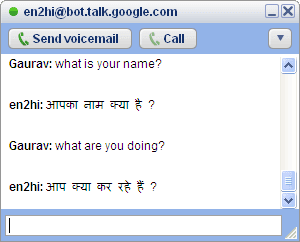 So you wanted to talk in Hindi during Chat. You have got a way to do so. Google had released Transliterations in Hindi some time back, and now they have released Chat bots to translate English into Hindi. So now you can send text in Hindi to your friends during chats. to your Google talk friends. # So select +Add button in Google Talk and add en2hi@bot.talk.google.com . # Press Next and Finish. # You will have a new buddy added as en2hi@bot.talk.google.com , Start Chat with it. # Type anything in English and it will translate it into Hindi and reply. how can i use it properly? Hi after pasting en2hi@bot.talk.google.com in gtalk the next button is not highlight. Wow ! it is such a great information. I will use it in my google talk. It will be really enjoyable in talking in hindi. Good to share it. Your Question: Hi after pasting en2hi@bot.talk.google.com in gtalk the next button is not highlight. "en2hi@bot.talk.google.com " i would suggest just go through it and put the email id properly. my Friend dont know English properly so she asked me to find how to Talk in Hindi in Gtalk. Gtalk has got some awesome features. Good to see. Hope they keep up the good work. While surfing today through my college network, I was greeted by a webpage which I hadn’t seen over all my years using Google It stated that “Our systems have detected unusual traffic from your computer network. This page checks to see if it's really you sending the requests, and not a robot.” and in order to continue you will have to fill the Captcha. I recently uninstalled a HP deskjet 1010 printer from my laptop, which went as smooth as possible. On my next boot, an error message popped up which showed that an HPstatusBL.dll was not found. This was the exact error message. The specified module could not be found. So here we are. This is to honor all those commenters of blog who review your blog and give their precious comments. So if you want to display the top most commenters of your blog along with their comment count this is a widget just for you. We have many plugins to do this in WordPress but when it comes to Blogger we didn't have many except a couple. So the earlier Top Commenters widgets were by AssessmyBlog which was modified by Amanda in her Top Commenter's Widget Post. Now a problem notified by Amanda about the Link shown by the widget linked to the most recent comment by the commenter and not the Site Url of the Commenter. So this was rectified by me and the following Widget was made. Thanks to Amanda for this small but beautiful Widget customization script. So the Usage part of the widget is very simple.